The film is used for the examination of disease or abnormality of viscera, bone or soft tissue, provides reliable information for clinical diagnosis. The film has sensitive emulsion layers on both side of blue polyester base sheet, and must be used with the blue emitting intensifying screen. This film is designed for 90-seconds automated processing or manual processing. 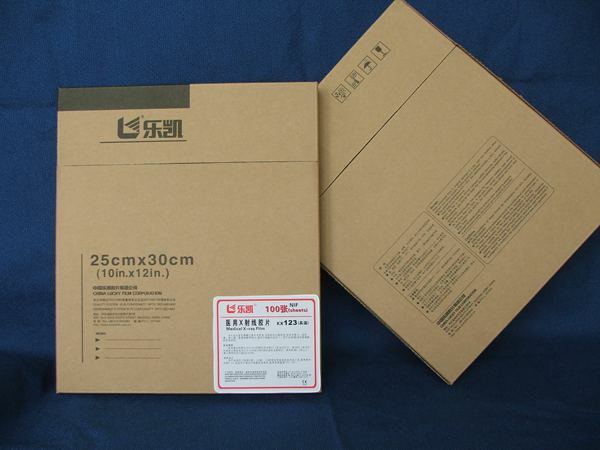 The former is recommended with lucky processing chemicals G-30 or G-31, developing 33.8 ℃ in 23s. The other processor with processing time of 120s, 150s, are recommended with other equivalent chemicals as lucky G-30 or G-31. In manual processing, Kodak developer D-19B with Lucky fixer F-5 or lucky powdery chemical G-39 are recommended. In this case, the film should be developed in temperature 20 ℃ for 5 minutes, fixed in 5 minutes, washed for 3-5 minutes and dried.